Many people describe feeling overwhelmed as well as being exhausted and increasingly unwell, before they realise that they are being adversely impacted by the sound and vibration energy. If you’re concerned that the wind turbines, mining, field compressors or other sources of environmental noise (with infrasound, low frequency noise and/or vibration frequencies) may be having an effect on you or your family’s health, one way of seeing whether or not your concerns are justified is to start keeping a detailed journal or diary. escribe feeling overwhelmed as well as being exhausted and increasingly unwell, before they realise that they are being adversely impacted by the sound and vibration energy. The following list of actions will help you to take charge of your situation. The most important thing, however, is to reduce your exposure as soon and as often as possible, especially if your symptoms are rapidly worsening. For most people, that means finding a temporary “safe haven” where they do not experience symptoms. Learn as much as you can about what is known about the impacts of infrasound and low frequency noise (ILFN). Our resources section has a lot of useful information in addition to the website content, as do other websites listed in the footer. Keep a detailed personal health journal, both when you are home and getting the symptoms, and when you are away from home, especially if you experience relief from the symptoms. Be aware that other sources of ILFN such as large compressors have induced some of the identical characteristic symptoms in people when away from their home (eg flying in some aeroplanes, driving in some cars, being in a building with a large air conditioning compressor). 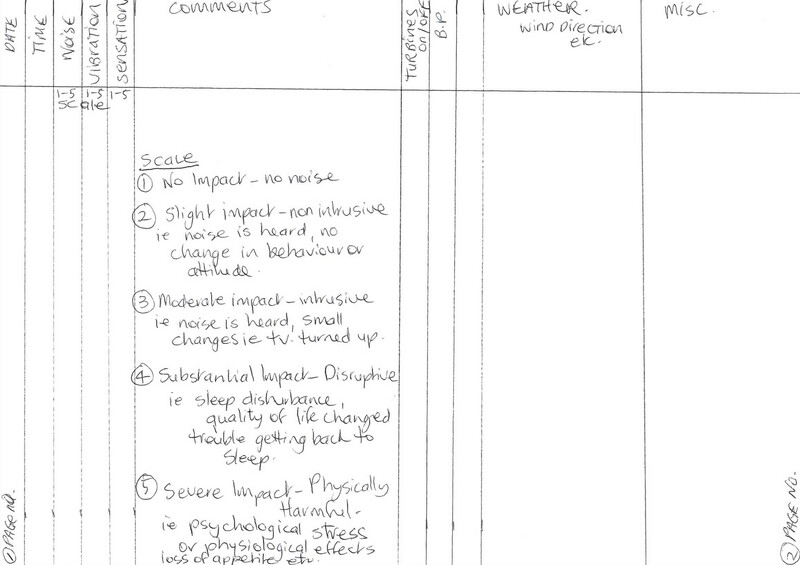 Use the information in your journal to work out for yourself if your symptoms are related to noise exposure. If they are, educate your health practitioner about your symptoms, and about the known science. Remember that many health practitioners have no or little knowledge of the old and new research, or of the correlation between infrasound and low frequency noise exposure, and the symptoms being reported by many. Regular exercise is very important, as is restorative sleep. If the noise and vibration is stopping you from having adequate restorative sleep night after night, it is inevitable that unless you can get away for breaks and have some decent good quality sleep, your mental and physical health will start to deteriorate over time. Link in with others who are affected, or concerned, and share information and support. Organising and networking are two activities which will help increase your lobbying strength and self help opportunities and reduce your feelings of powerlessness and isolation. There may be local solutions you can source, such as temporary respite accommodation which will give you a break and a decent sleep if you do not have somewhere you can relocate to. For example some residents at existing noise pollution affected sites have linked up with residents opposing similar proposed developments elsewhere, and accept hospitality in return for sharing their experiences first hand. If you can, get some idea of the acoustic exposures in your home or workplace. Formal complaints to wind developers and noise regulatory authorities and full spectrum noise monitoring inside and outside your home, with full provision of all the acoustic data to you is the ideal to sort out the problem, but doesn’t happen in practice. Nevertheless it is worth requesting. Alternatively, if you have sufficient financial resources you can employ your own acoustician. The Waubra Foundation have a list of acousticians who have demonstrated the highest ethical standards of their profession, to protect the health and safety of the public. We also know some of the objective researchers who may be interested in measuring the full spectrum of noise and in the impacts you are experiencing, and can put you in touch with them directly. Lobby all relevant levels of government, and ensure that they are aware of your situation, in writing. Make sure they too are made directly aware of the knowledge of the adverse health impacts being experienced – preferably by coming to visit you in your home, and hearing your story. If they won’t come to you, make appointments to see them in person. If you are happy to speak out publicly in the media about the problems in your area and the need for accountability for the noise pollution, and the urgent need for research, please do so at every opportunity. Spend the time educating the local journalists about the reality of your situation – it is the only way to expose the spin of the wind developers. Write letters to the editor of local, state and national newspapers, as that way the editors know this is an issue of genuine local concern, even if they don’t print your letters. 10. Consider seeking experienced legal advice. A noise abatement order may be an option, used successfully in the UK in cases of noise nuisance. A case for noise nuisance from a wind turbine initiated by Jane and Julian Davis was settled confidentially in the UK High Court in late 2011. The Information for Lawyers in our website details other options which may be worth considering.